Urinary protein biomarkers and metabolomic markers have been leveraged to detect acute Drug Induced Kidney Injury (DIKI) in rats; however, the utility of these indicators to enable early detection of DIKI in canine models has not been well documented. Therefore, we evaluated temporal changes in biomarkers and metabolites in urine from male and female beagle dogs. 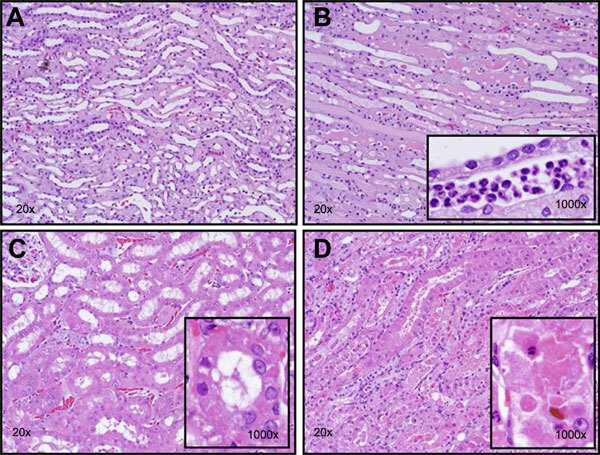 Gentamicin- induced kidney lesions in male dogs were characterized by moderate to severe tubular epithelial cell degeneration/necrosis, epithelial cell regeneration and dilation; and a unique urinebased metabolomic fingerprint. These metabolite changes included time and treatment-dependent increases in lactate, taurine, glucose, lactate, alanine, and citrate as well as 9 other known metabolites. As early as 3 days post dose, gentamicin induced increases in urinary albumin, clusterin, neutrophil gelatinase associated protein (NGAL) and total protein concentrations. Urinary albumin, clusterin, and NGAL showed earlier and more robust elevations than traditional kidney safety biomarkers, blood urea nitrogen and serum creatinine. Elevations in urinary kidney injury molecule 1 (KIM-1) were less reliable for detection of gentamicin nephrotoxicity in dogs based on values generated utilizing multiple first-generation, canine-specific KIM-1 immunoassays. The metabolic fingerprint was further evaluated in male and female dogs that received Compound A which induced slightly reversible renal tubular alterations characterized as degeneration/necrosis and concurrent significant increases in urinary taurine amongst other markers. These data support further investigations to demonstrate the value of urinary metabolites, albumin, clusterin, NGAL and taurine as promising markers to enable early detection of DIKI in dogs. Keywords: Acute Drug Induced Kidney Injury (DIKI), Rats, Protein biomarkers, Metabolomics, NGAL, EMA. Keywords:Acute Drug Induced Kidney Injury (DIKI), Rats, Protein biomarkers, Metabolomics, NGAL, EMA. Abstract:Urinary protein biomarkers and metabolomic markers have been leveraged to detect acute Drug Induced Kidney Injury (DIKI) in rats; however, the utility of these indicators to enable early detection of DIKI in canine models has not been well documented. Therefore, we evaluated temporal changes in biomarkers and metabolites in urine from male and female beagle dogs. Gentamicin- induced kidney lesions in male dogs were characterized by moderate to severe tubular epithelial cell degeneration/necrosis, epithelial cell regeneration and dilation; and a unique urinebased metabolomic fingerprint. These metabolite changes included time and treatment-dependent increases in lactate, taurine, glucose, lactate, alanine, and citrate as well as 9 other known metabolites. As early as 3 days post dose, gentamicin induced increases in urinary albumin, clusterin, neutrophil gelatinase associated protein (NGAL) and total protein concentrations. Urinary albumin, clusterin, and NGAL showed earlier and more robust elevations than traditional kidney safety biomarkers, blood urea nitrogen and serum creatinine. Elevations in urinary kidney injury molecule 1 (KIM-1) were less reliable for detection of gentamicin nephrotoxicity in dogs based on values generated utilizing multiple first-generation, canine-specific KIM-1 immunoassays. The metabolic fingerprint was further evaluated in male and female dogs that received Compound A which induced slightly reversible renal tubular alterations characterized as degeneration/necrosis and concurrent significant increases in urinary taurine amongst other markers. These data support further investigations to demonstrate the value of urinary metabolites, albumin, clusterin, NGAL and taurine as promising markers to enable early detection of DIKI in dogs.